Dr. Yakov Kots became famous for using electro stimulation in the training programme of Russian athletes and his resulting studies were made public at the 1976 Montreal Olympics. The electrical current used for stimulating athletes was called Russian Current, or Kots current, and was soon also used by the athletes of other countries thus becoming a widespread sports training method. - burst stimulation of 10 seconds of electric pulses. In order to avoid precocious exhaustion of the muscle, which takes place after 12-15 seconds of continuous stimulation, Kots identified the ideal work duration as 10 seconds (pulsed in sets of 10 msecs alternated by a 10 msec pause), followed by 50 seconds of rest with a 1:5 Duty Cycle. With respect to other low frequency motor exciting currents, this type of current seemed to assure a better work-out of the muscle mass, with deeper action, and was also considered more tolerable. The motor exciting effect of the Kots current, as opposed to other types of current, is realised deep within the muscle because the puts up less resistance to this current. It has, in fact, been demonstrated that as the frequency increases, the skins resistance diminishes. Among the motor exciting currents the sinusoidal currents with medium frequencies are better tolerated by the patient. This happens because when the frequency of the current is increased a discrepancy is created between the thresholds of muscular contraction and that of feeling pain. At a frequency of between 3.000-8.000 Hz the pain sensitivity threshold is higher than the motor exciting one. At these frequencies the electric impulses stimulate the nervous motor fibres more and those of sensitivity to pain less and, therefore, provoke practically painless muscular contractions. Applications of Kots currentsThe Kots sinusoidal current has, however, found an important field of application in orthopaedics, in the treatment of scoliosis according to the SPES (Surface Paravertebral Electro Stimulation) method. Paravertebral Electro Stimulation is a relatively new method and its worth is still the subject of discussion, but it must be recognised that in certain well selected cases it can actually postpone the use of a corset without any risk to the patient. Another sector in which the electro-therapy of innerved muscle can be applied is Functional Electrical Stimulation (FES). Numerous scientific experiments exist which describe electro stimulation of hemiplegics through the electric stimulation of non-nervously controlled non-spastic muscles with the aim to provoke a muscular contraction which can then produce a functional movement. It must be remembered that hemiplegics do not have muscular paralysis due to lesions of the peripheral nerves, just as the contraction abilities of their muscles are not altered; therefore there are conditions for the application of electric stimulation. 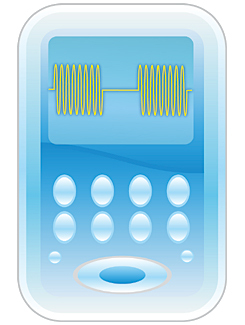 Electro therapy with Kots currents is also put to good use in muscular transplants, to insure adequate trophism for the newly transplanted muscle’s function, as well as to help the patient gain knowledge about his new functional condition, thanks to the afferent produced by the induced muscular contraction.